This project was the only one I supported on Ideas and it is awesome to see that it became a real set. 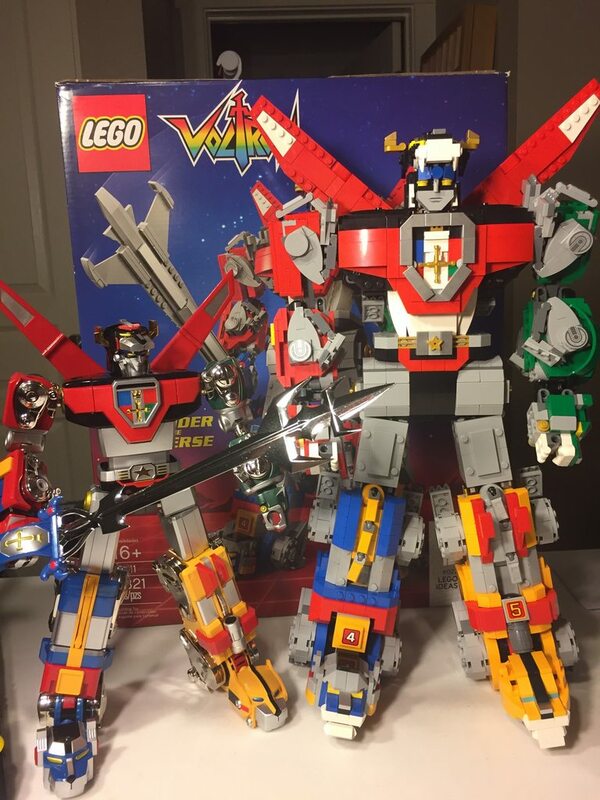 So am I a huge Voltron fan? No, but everything that has something to do with my childhood has a great appeal to me. All the classic tv shows and cartoons, like M.A.S.K, Transformers, Voltron and so on were amazing to watch as a child(and still as an adult). 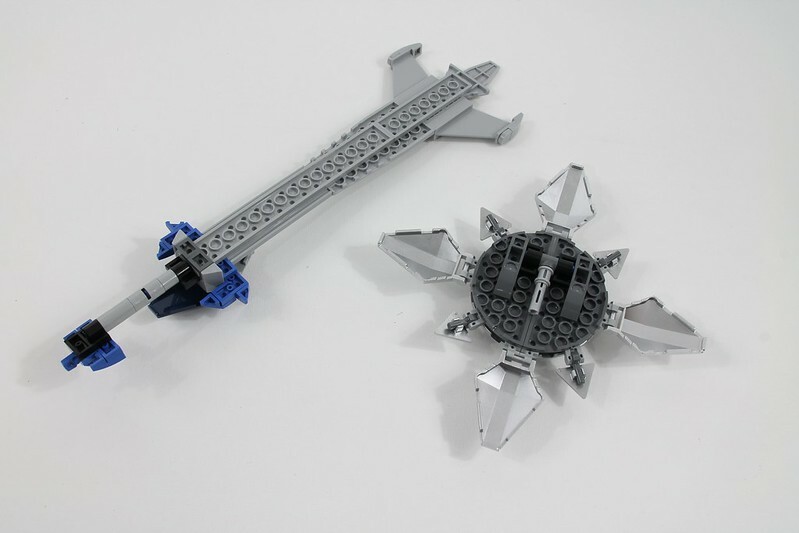 It also was a huge inspiration to build stuff like that. So seeing it become a set is simply amazing! 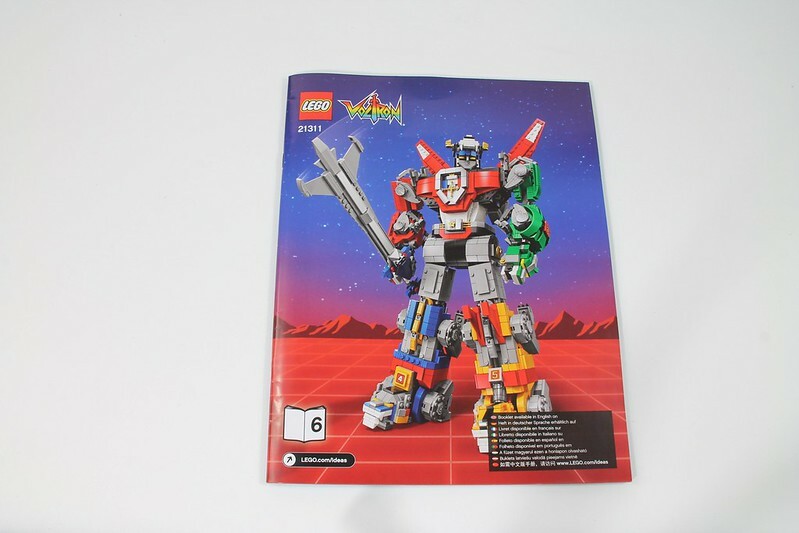 The front of the box shows Voltron and has the Lego Ideas logo on it. Of course, the number 22 is also shown because this is the 22nd set that made it into production. 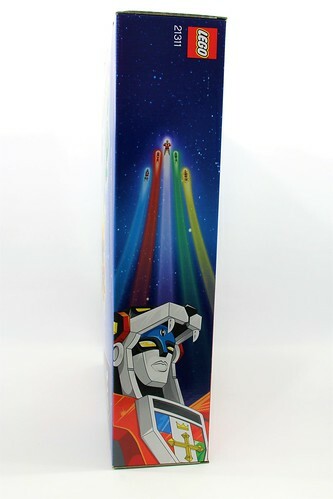 The sides of the box are covered with some great animation from the tv show and also of the lions flying in formation. 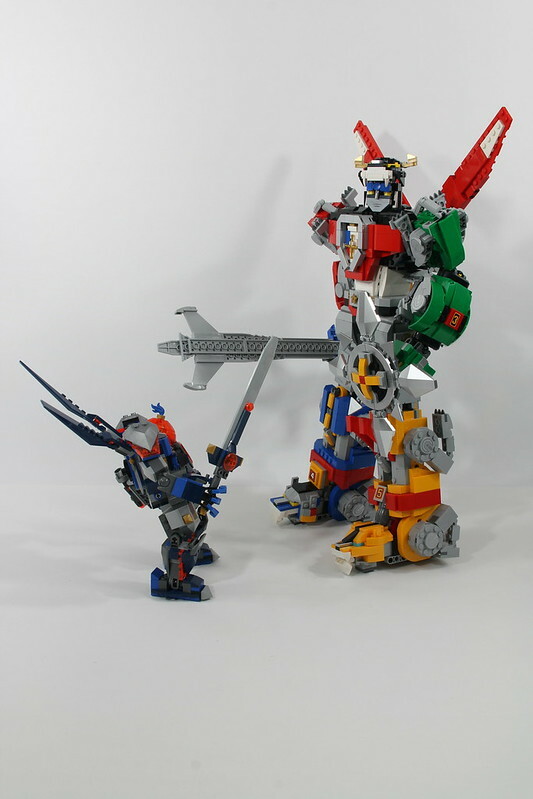 And it gives you a good depiction of how close the set is to the tv show Voltron. Just by shaking the box before opening it, It was sure it was filled with plenty of Lego. Almost no room for air this time. The total of 16 bags made it worth opening. And that's not surprising because this is the largest Ideas set so far. It's good to see that each of the lions has its own booklet. Which gives it a more exclusive feel. 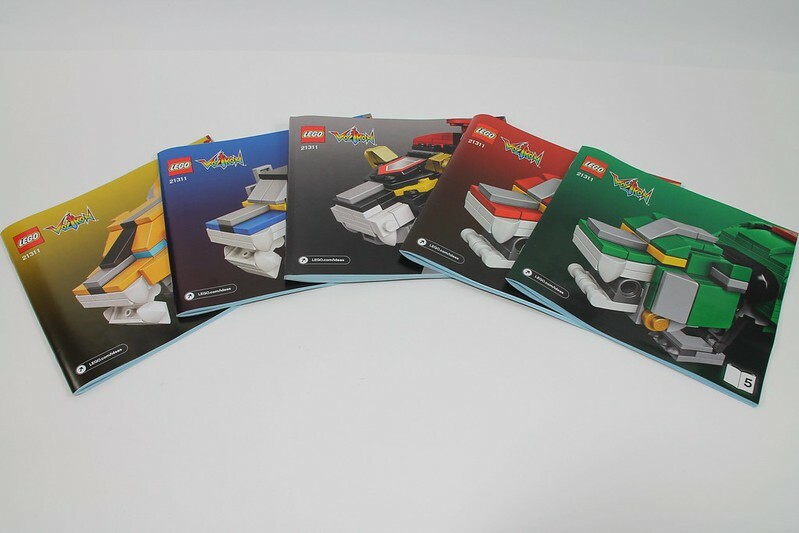 The last booklet is the one that shows you the instructions of the shield and sword. 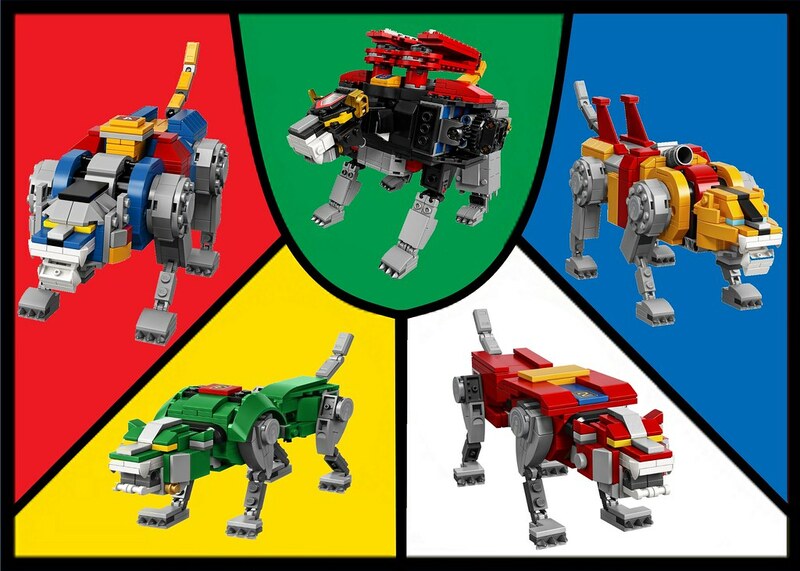 Also, the instruction for transforming the lions into Voltron are shown. The most important part of the Ideas sets is, of course, some background information about the set. So it tells you a bit about the show. All the pilots are shown as well. 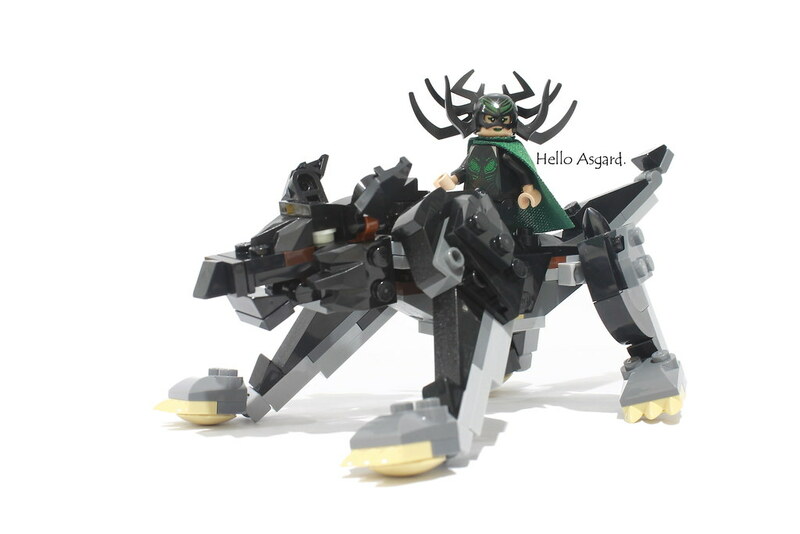 To be honest, wouldn't it be a great addition if they were added to the set as a micro fig? This is probably the most interesting part about the set. 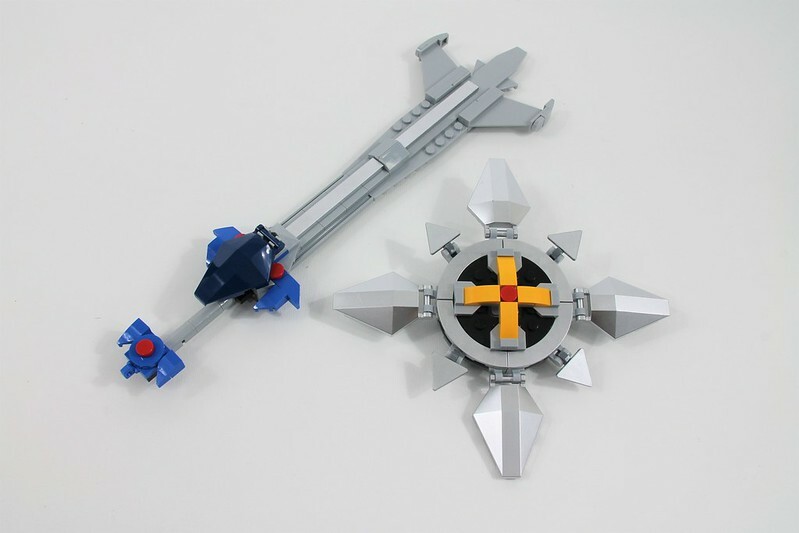 It's always nice to see how a set eventually came to be. 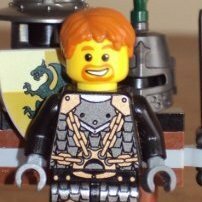 The best thing about the final model is that they managed to make the head, well except for the mouth, brick build. In a lot of the previous models, it was completely printed. Printed parts, yes! That's what we want! Especially the 2x2 round tile with the "mechanical" print is one of the best prints I've seen in a while. 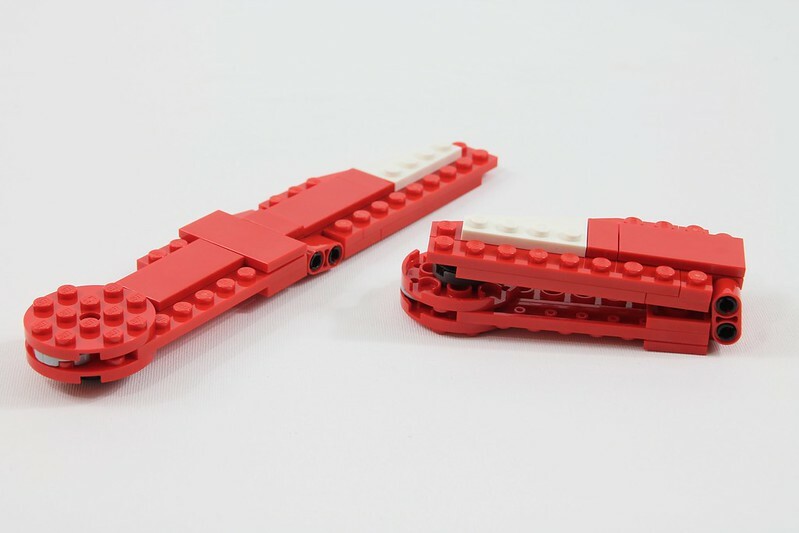 Because I can definitely use those in other mocs as well! For space, steampunk, you name it. 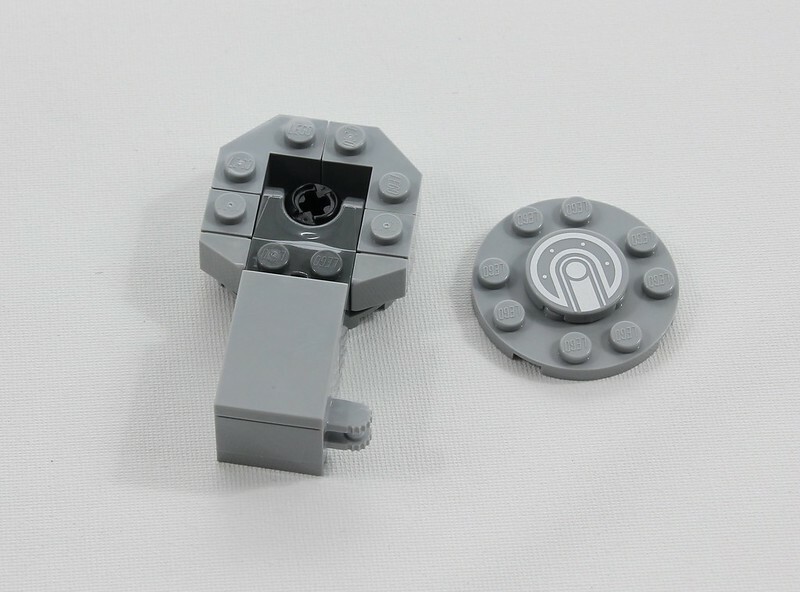 So this part will become popular on bricklink for sure. Shiny! Yes, there's a lot of those in there! 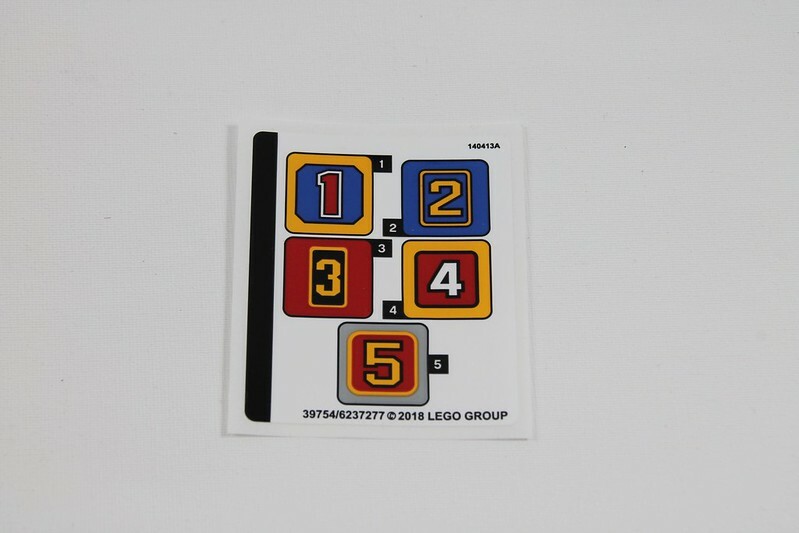 Stickers... That's quite a bummer, considering the other important parts being printed. Or is it? For once this was a good decision because in the Japanese version of the show the Lions did not have numbers on them. The American version however did. So this way you can decide which animation you want to follow. The first of the three bags to make the lions contains most of the body. 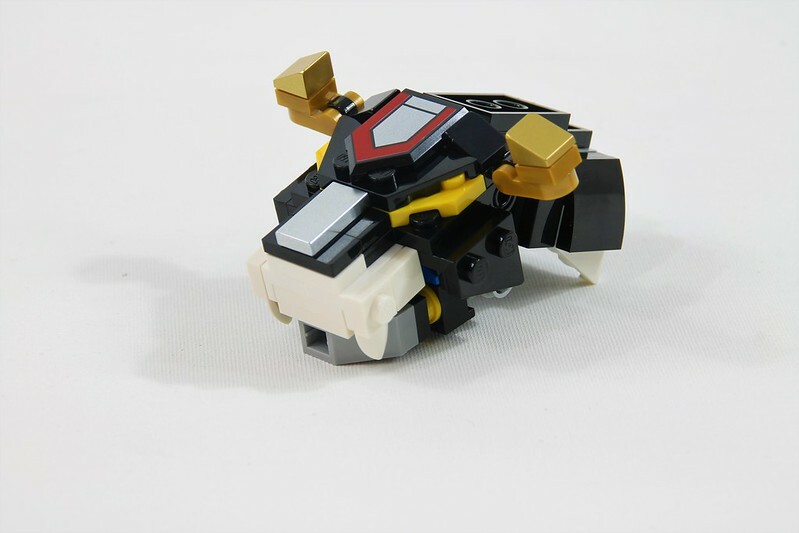 Which is quite sturdy and it has to be because it will become a foot when forming Voltron. 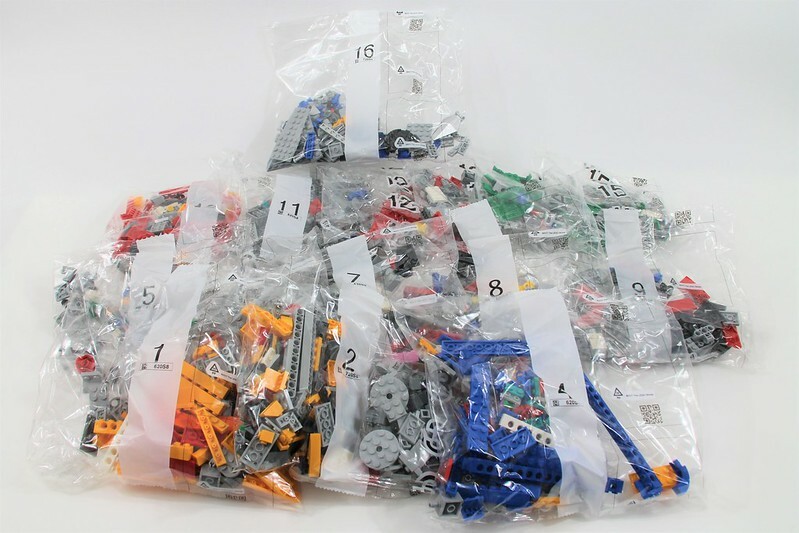 The next bag contains parts for the shoulders and head. And this has to be supported by a technic beam. Because later on when transforming, you will have to push it in a 90-degree angle. 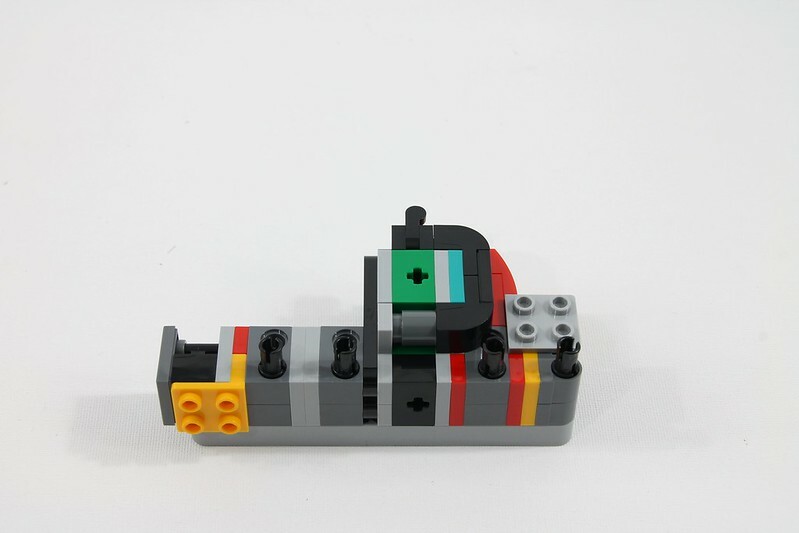 Without the technic beam, it wouldn't be possible to put so much pressure on it. It would break. 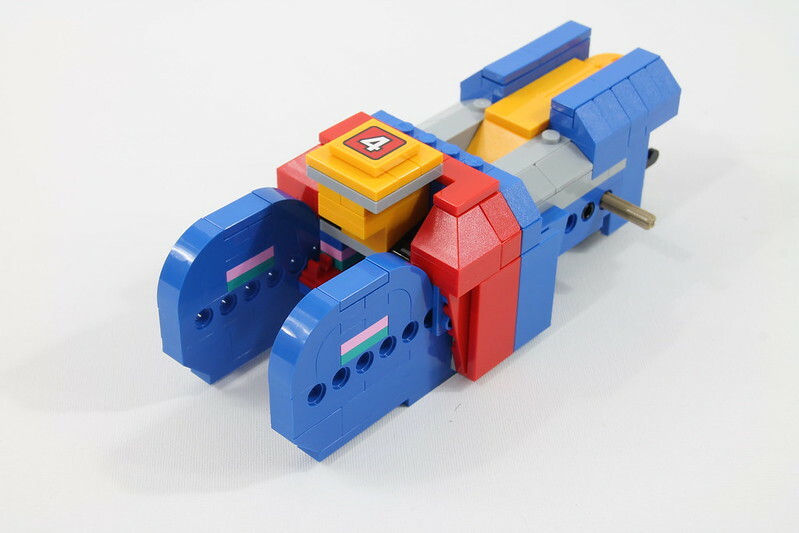 When forming the head you would think that the finger plate is there so you might open it's mouth. 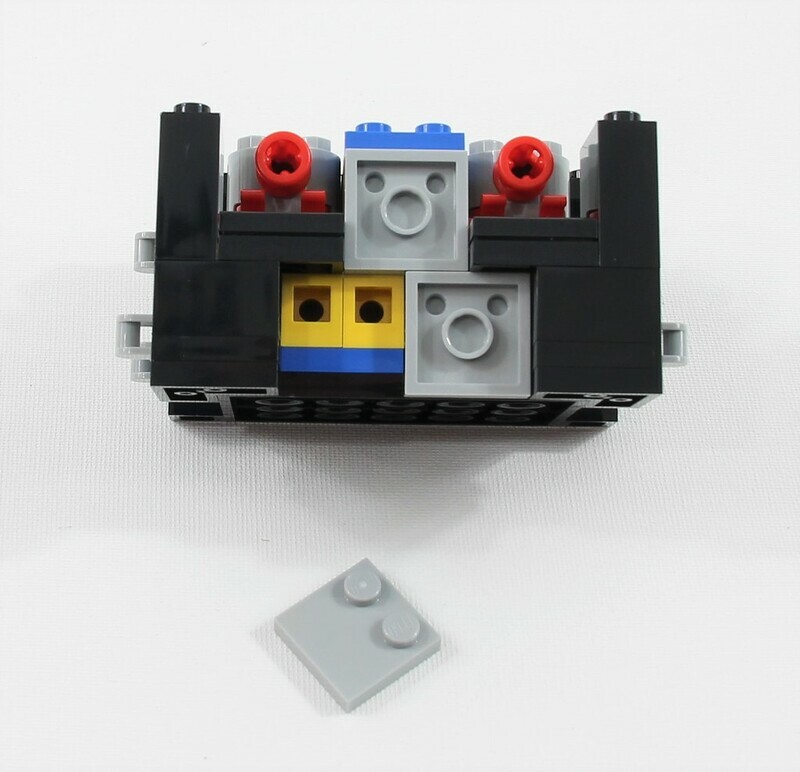 It's not, instead it's a clever way to put the 3x3 plate in the middle together with a jumper plate. If you want to open the lion's mouth. It's only possible by moving its lower jaw which is a bar and clip connection. The last step of booklet two is connecting the head and shoulders part to the rest of the body. When in place an axle is used to make sure it stays there and it's also the connection for the legs. 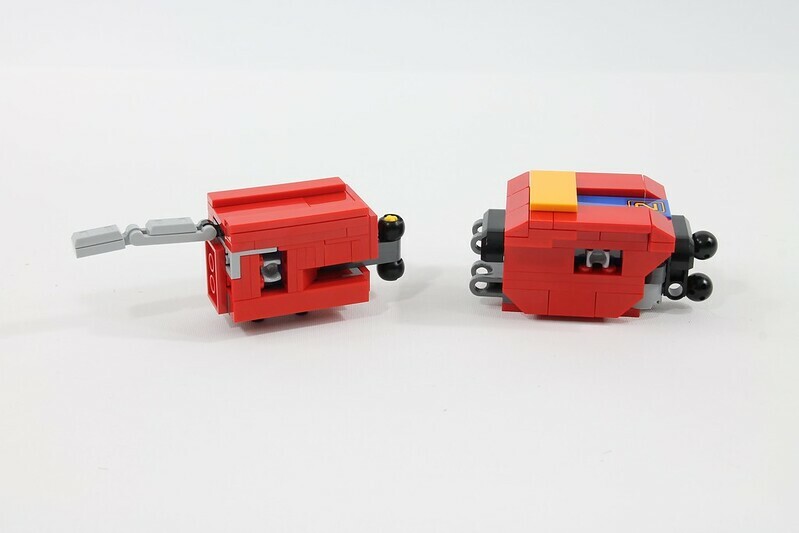 To make the legs turn Lego used a ball joint with an axle connection, which is a very good connection in such a small space. 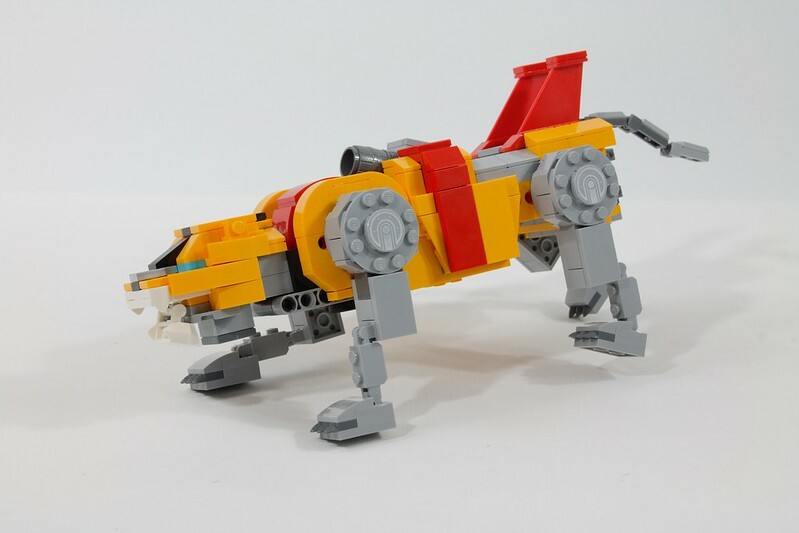 And the Yellow lion is ready for Battle! 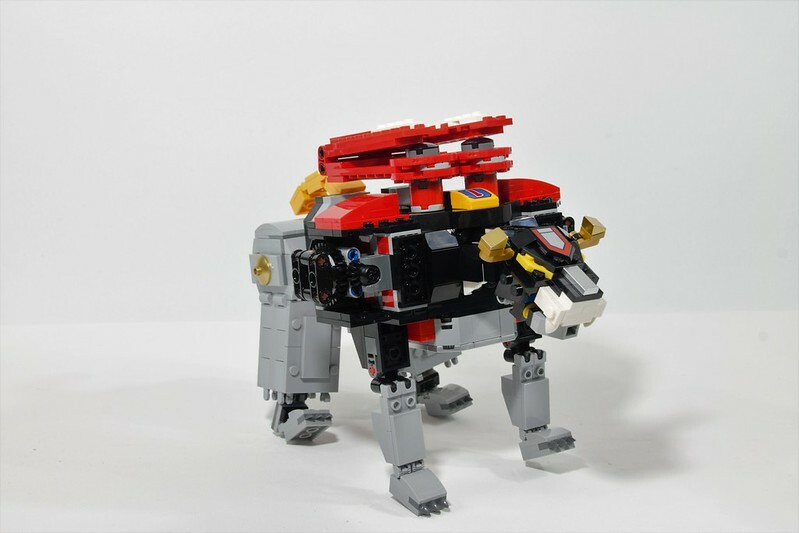 The back of the lion shows the connections which are needed when forming Voltron. There's space to put the black lions foot in and when doing so you can click it into place by attaching it to both the bars and fingers. 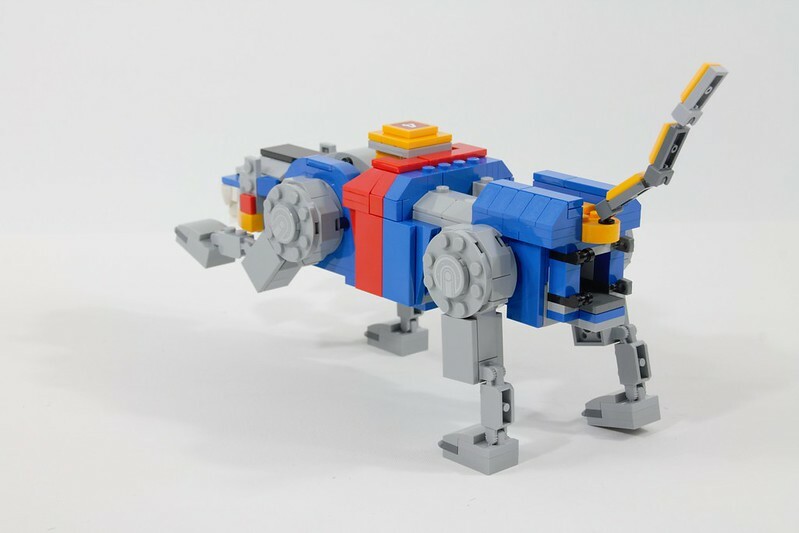 The building of the blue and yellow lion is almost identical. Not considering the detailing of numbers and colors. Here in the middle, you can see the clip that holds the shoulders and head in position when it's in lion form. 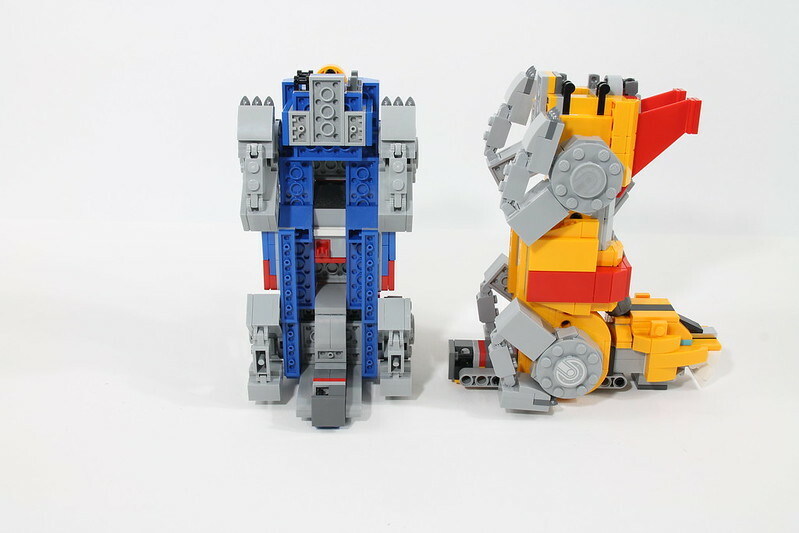 A clever solution to make sure Voltron stands up correctly is the use of the tires. 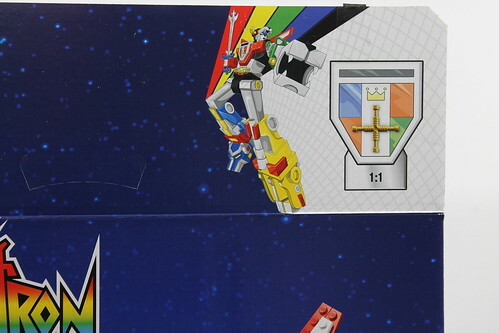 The rubber is a perfect material to make sure Voltron doesn't slide off the shelf into more than just five lions. 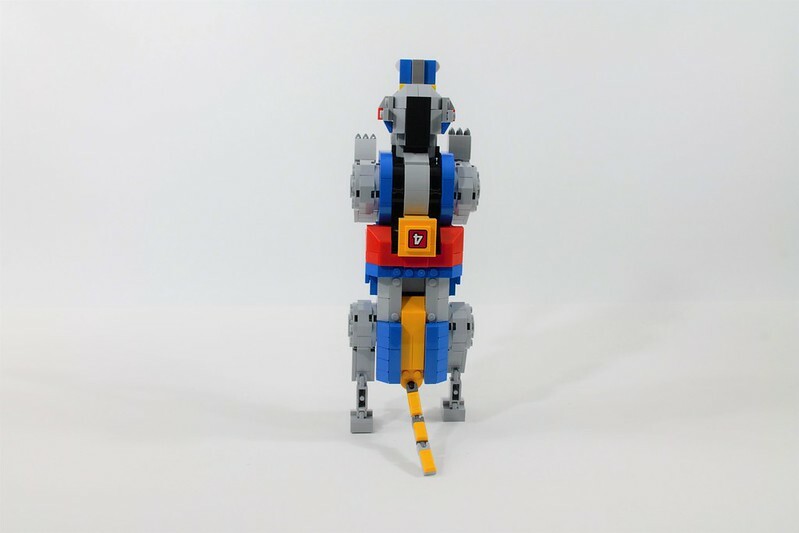 Although the bodies of the blue and yellow lion are quite static, the legs make it possible to pose in a lot of different positions. 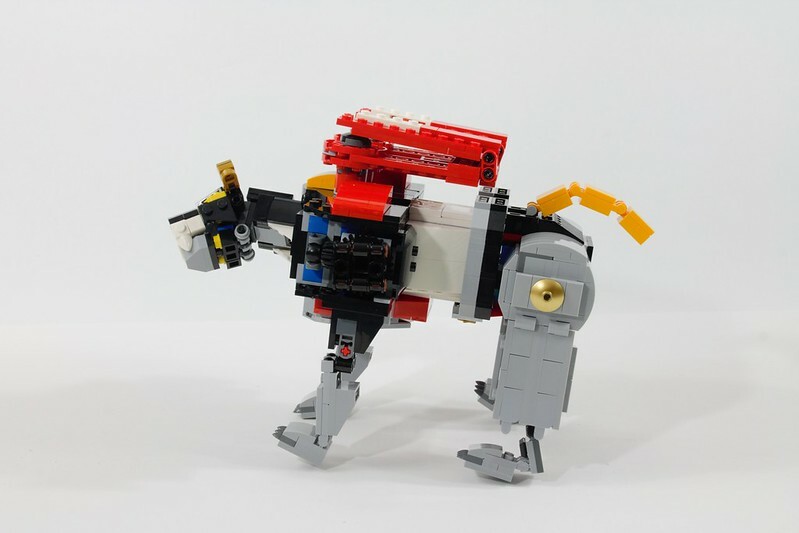 The tail makes it even possible to stand on its hind legs. A sturdy body to hold all the limbs together. 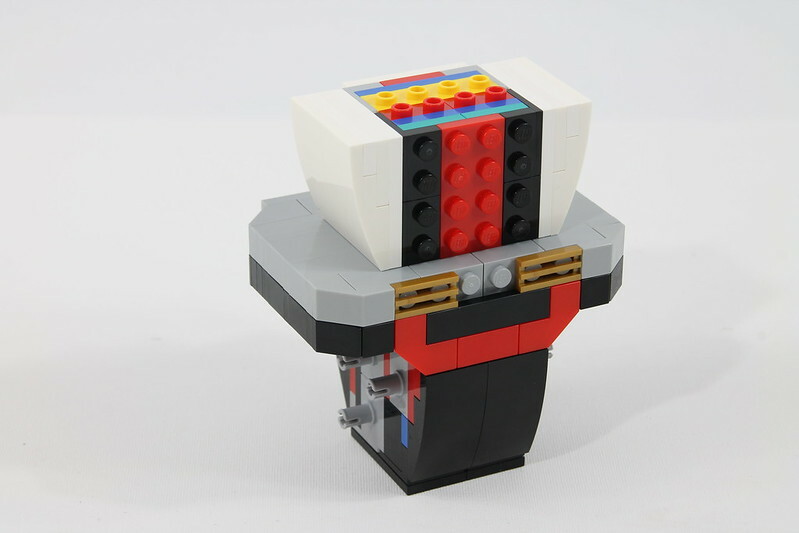 It's a good thing they made the front of Voltron brick build considering Lego did consider using a sticker. The really nailed it. 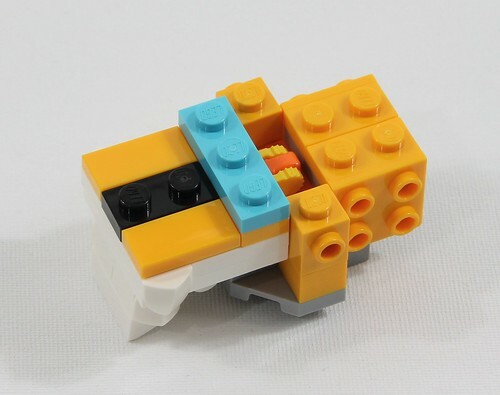 The front legs are connected with a bar and clip connection. 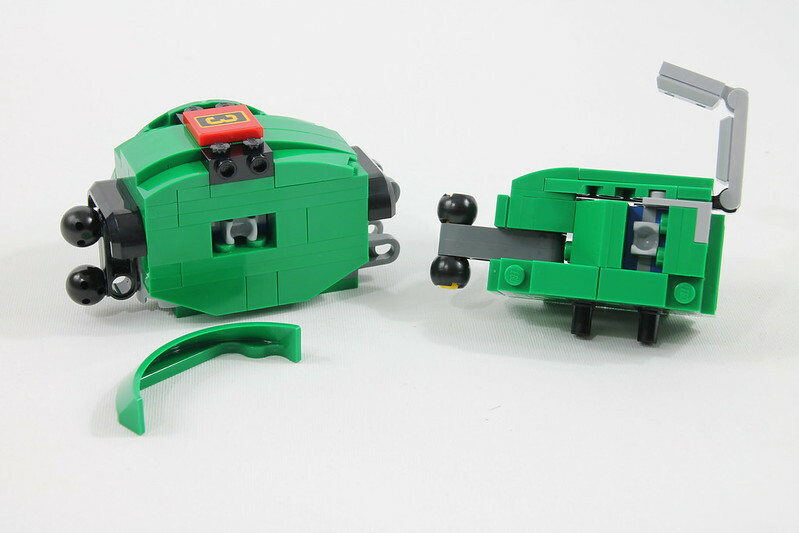 When transforming later on you can just pull it of and click it back together again. By seeing the box art I was wondering how the legs would be made. 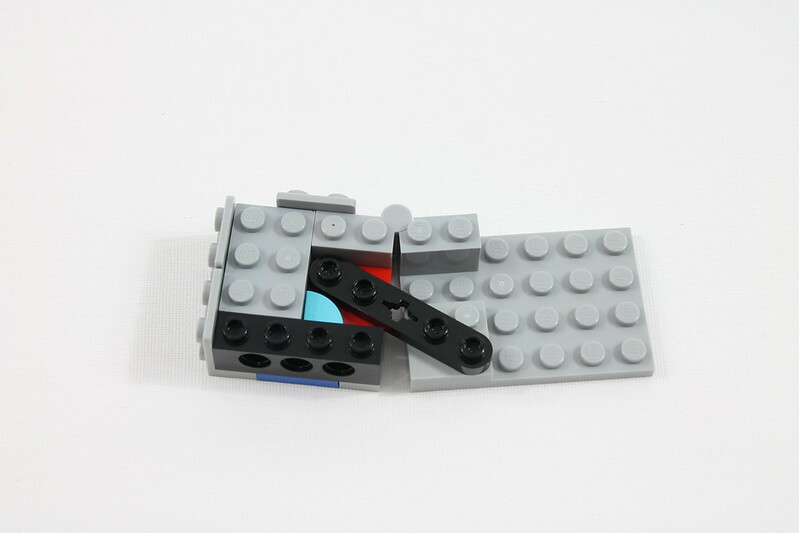 I did see the hinge brick and knowing this is a part that's quite loose I expected the legs to be loose as well. But it's actually used to make a small bend. And it's done quite clever. 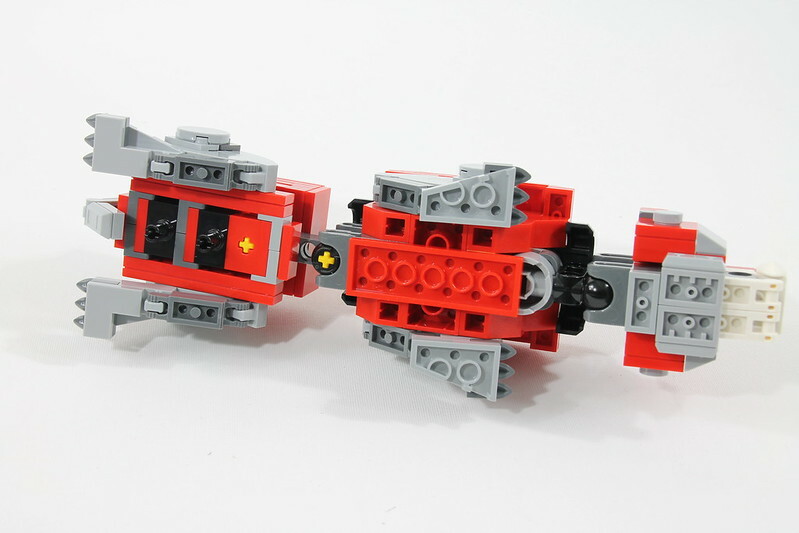 You are able to fold the wings with a beam in the middle which is working really smooth. 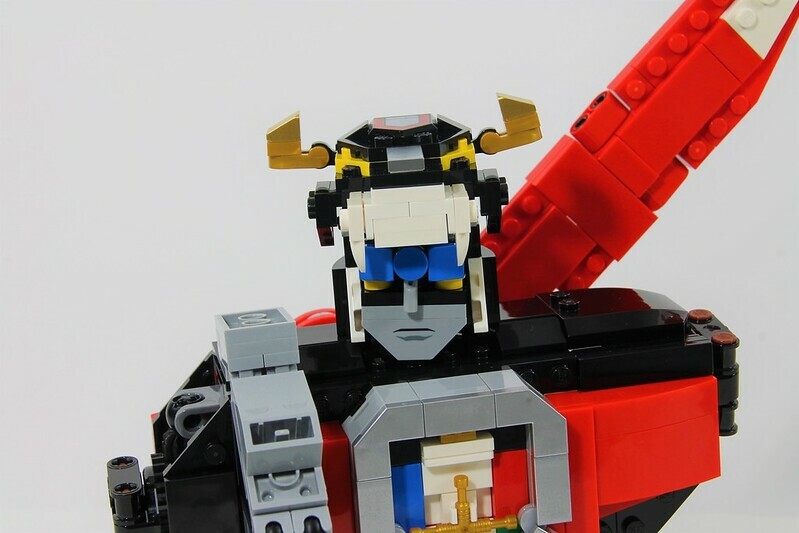 The head is very well made, considering it also hides Voltron's face and that is able to transform on such a small scale is impressive. It's the largest of all the lions, but also the most static one. Yes, you can bend its front legs, but it comes down to just wiggling its toes and turning its head. And before I forget it can also wiggle its tail. Two bags are reserved for the red lion. 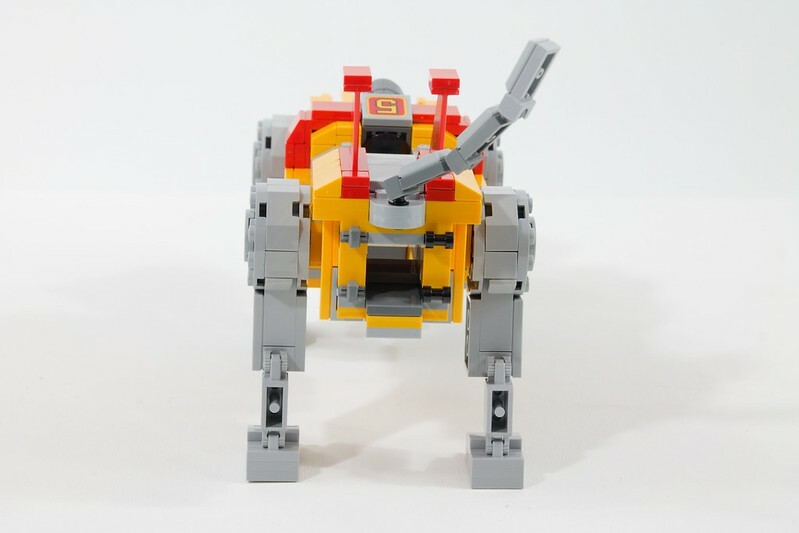 The first one contains the upper and lower body which you have to connect with ball joints. The second bag has parts for the head and legs. The four legs are almost identical, except for the upper part being mirrored. As you can see the mouth of this lion can't open. 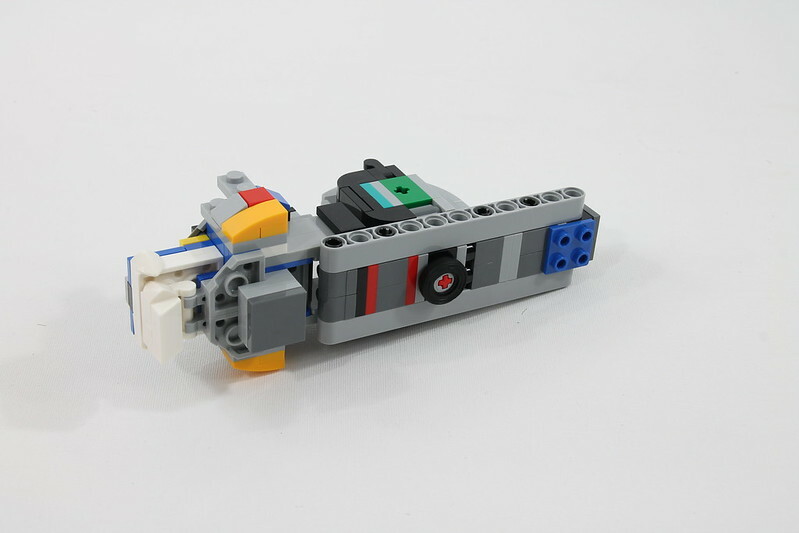 It's already sort of open, so you can put the sword int its mouth using a technic pin. 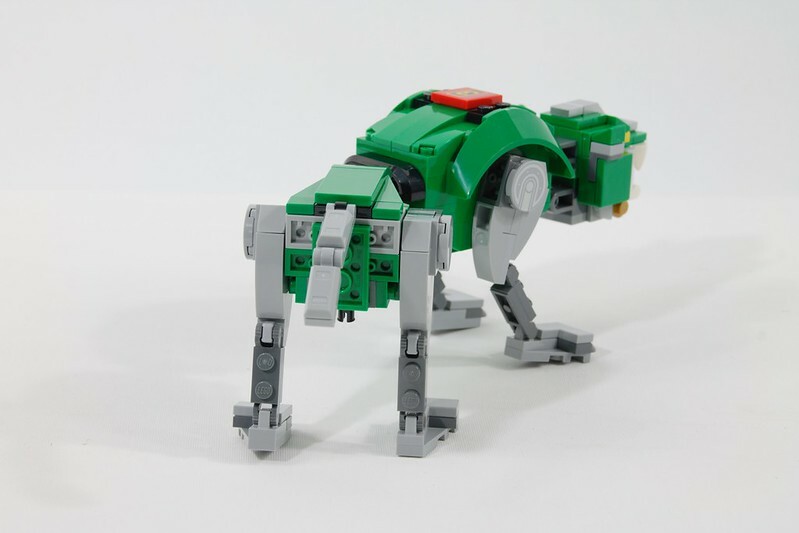 The green lion is almost identical to its red brother. It just has a more slender like because of the shoulder detailed. 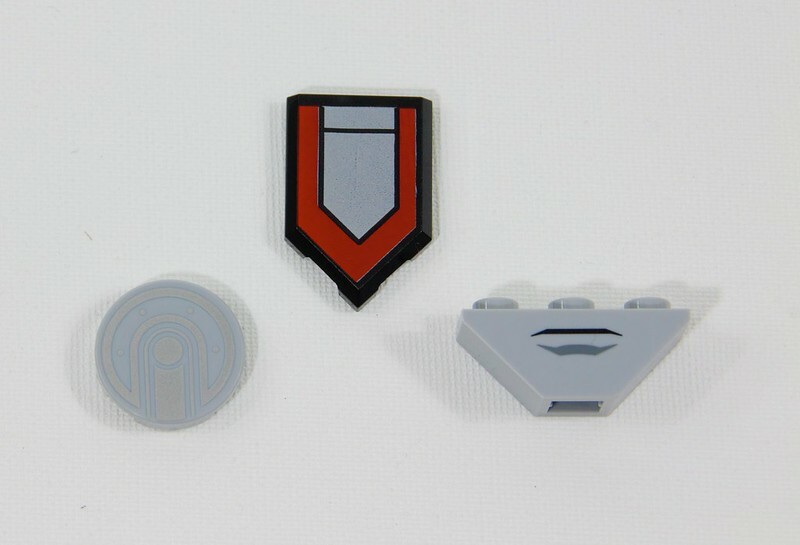 In this photo, you can also see the two technic pins underneath which are later on used to connect to Voltron at the shoulders so it can serve as an arm. "Form blazing sword!" 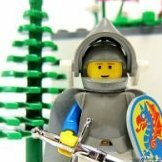 The sword is created out of nothing, it just appears out of its hands. Science, duh! 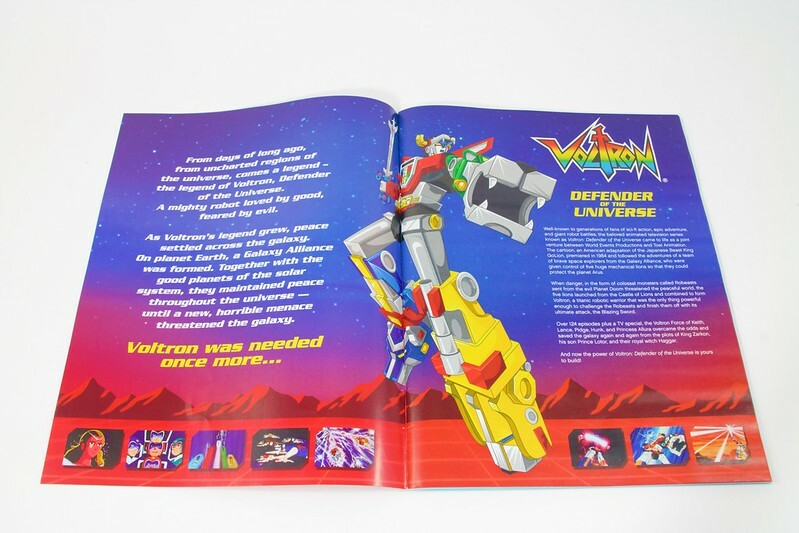 So it's understandable that the instructions are added to the transformation booklet. All the lions are done. 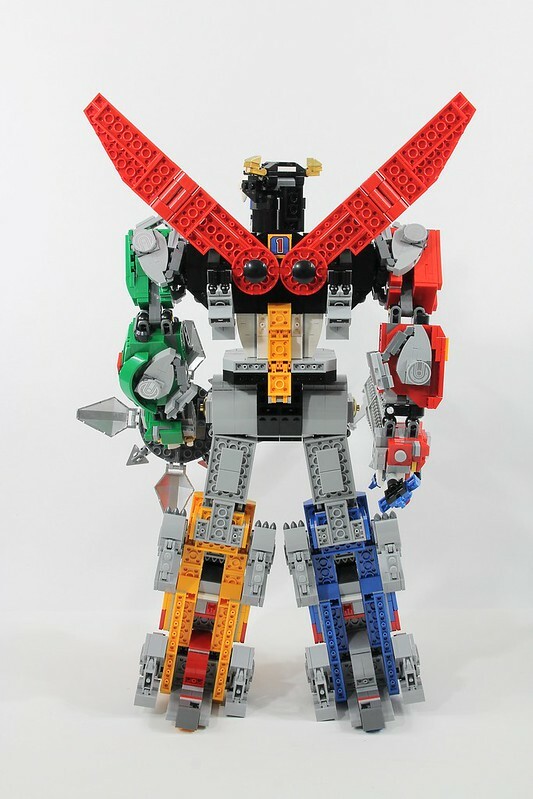 Time to form Voltron! "Activate Interlocks!" The transformation starts with the Blue and Yellow lions. This is the easiest step. By just holding the lions at the side you can press the head op until it's in a 90-degree angle. After that, you have to make sure to fold the legs correctly. 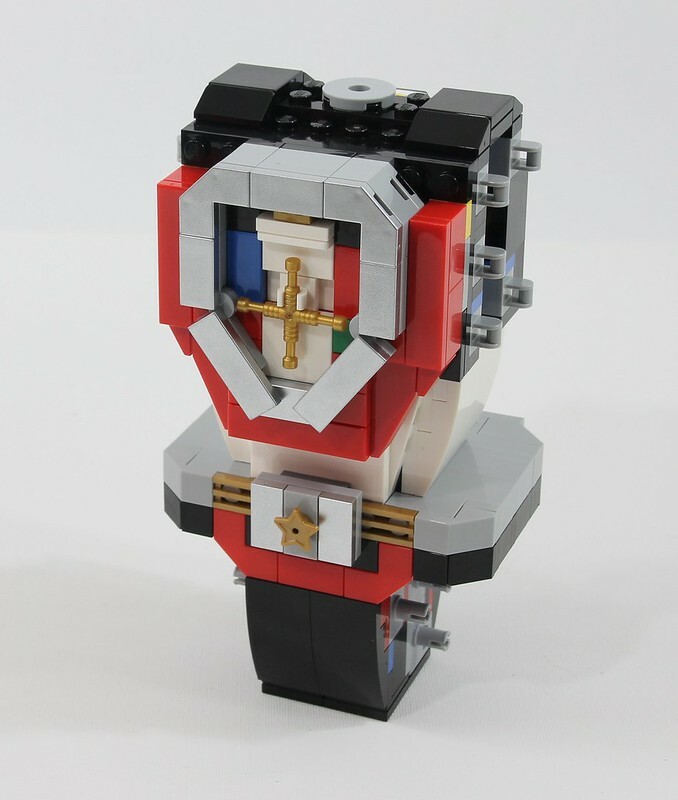 By disconnecting the shoulders and turning those 180-degrees you can see that Voltron's chest is being formed. The legs have a similar process, but only a turn of 90-degrees will do the trick. 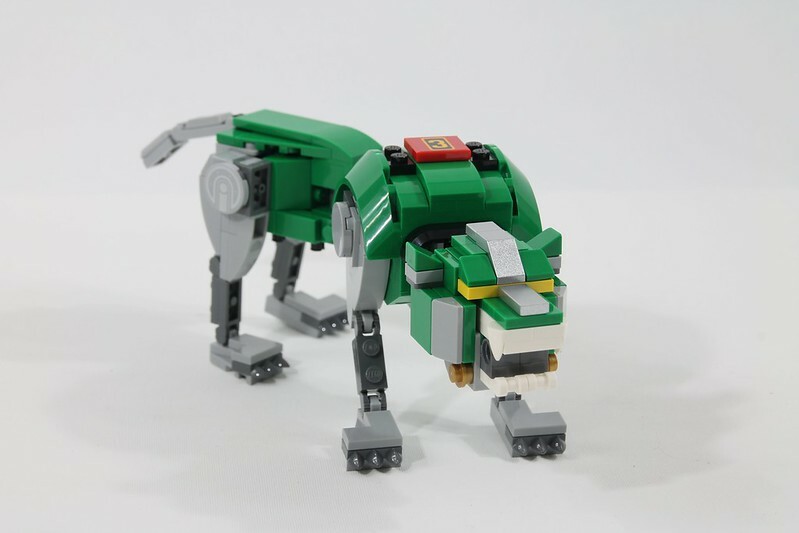 Transforming the red and green lion is the simplest. Just fold the legs forward and backward. 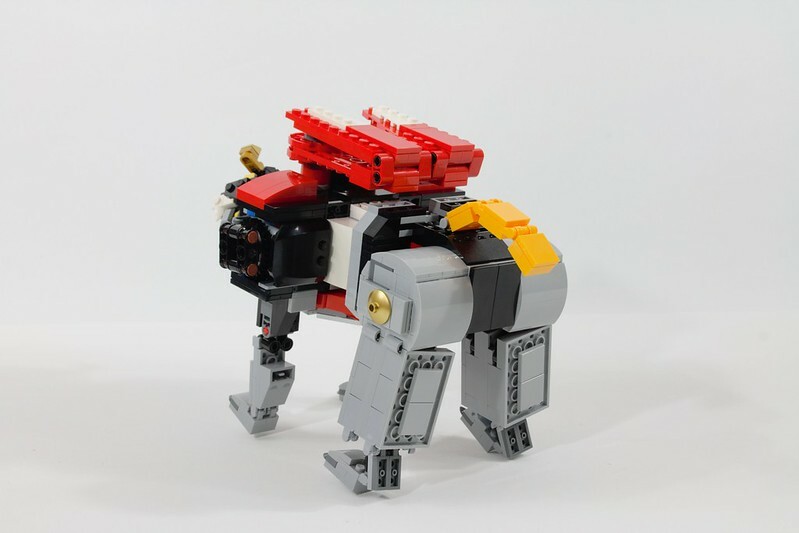 When that's done, you can simply connect the pins under the lions into the black lion's shoulders. 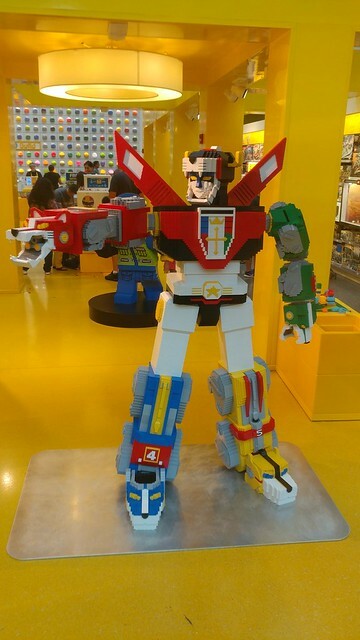 And Voltron's transformation is complete! The back is less appealing compared to the front. But now worries, I doubt this will be the side that will be on display anyway. Not often a box depicts a set so well as this one! 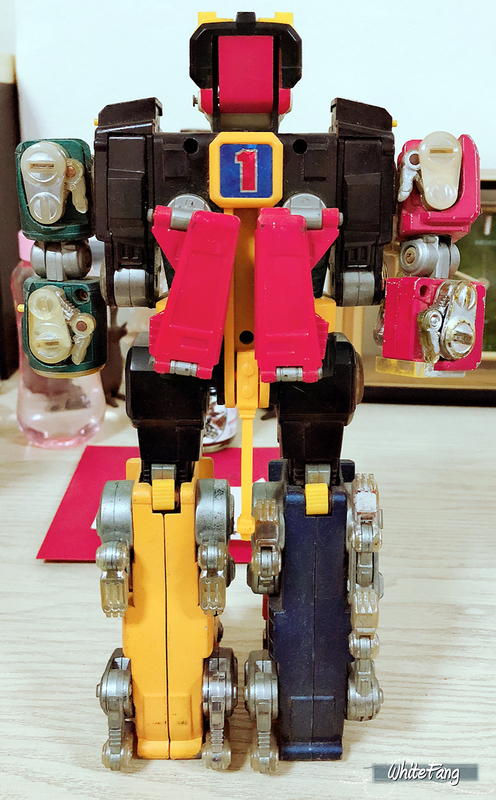 Design: 8/10 Almost perfect, it is impressive how such a large and heavy model is able to transform, stand firmly and is still able to be posable. 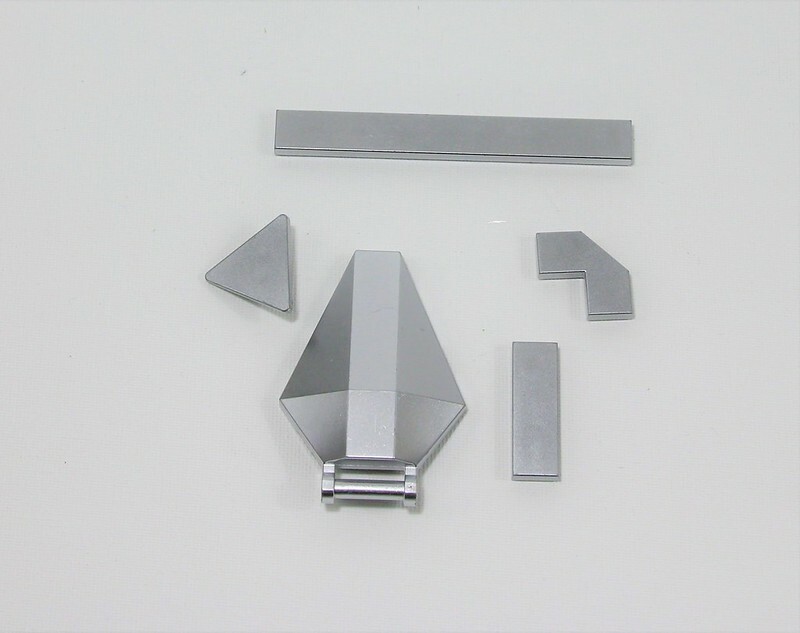 Parts: 8/10 While most parts are quite generic, those chromed pieces and the 2x2 tile are definitely worth having more of! Building: 8/10 The green and red lion were similar to build. Same goes for the blue and yellow lion. Did that make building those a bit dull? No, both models have enough different details to make putting it together interesting enough. And of course, the black lion is completely different which makes the building experience complete. Personally, I keep thinking that the "baby" steps of adding just two are three bricks per step are ridiculous. 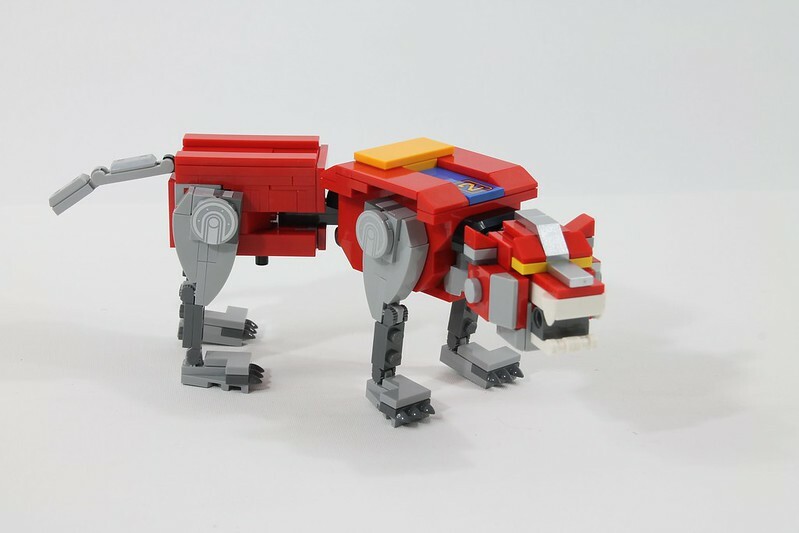 But considering this happens in every set and probably works better for kids makes it ok.
Playability: 8/10 While the lions are easy to play with, Voltron isn't. It's just too big. And the lions are missing some play features from the movie. Like canons or mouth blade. Price: 8/10 It's a good price. Yes, the set is expensive but that's because it has a large number of bricks. But considering it's also a licensed set I don't think there's any reason to complain. Overall conclusion: 8/10 Woah so many eights! Swooshing and more swooshing. 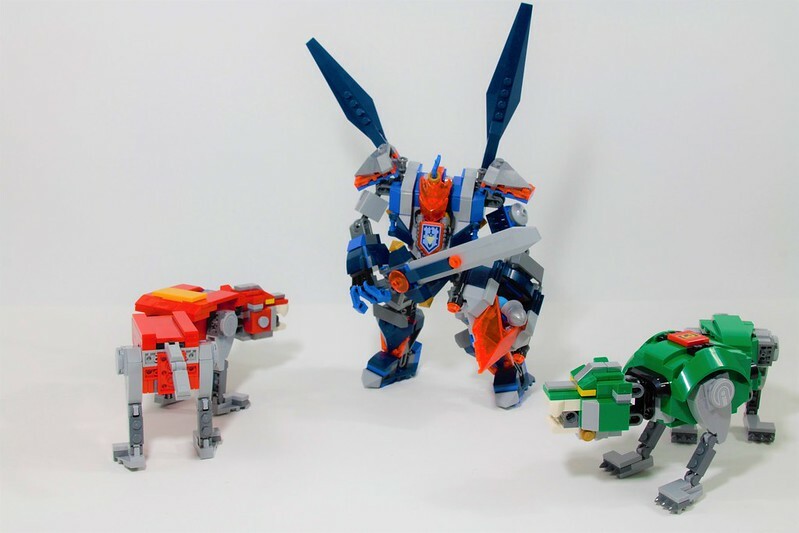 It's five lions that transform into a giant robot. Is it really necessary to say more? It's just so awesome! I'm very impressed by how good it looks and how stable it seems. I supported this as soon as I saw it, I've only ever supported 2 projects. 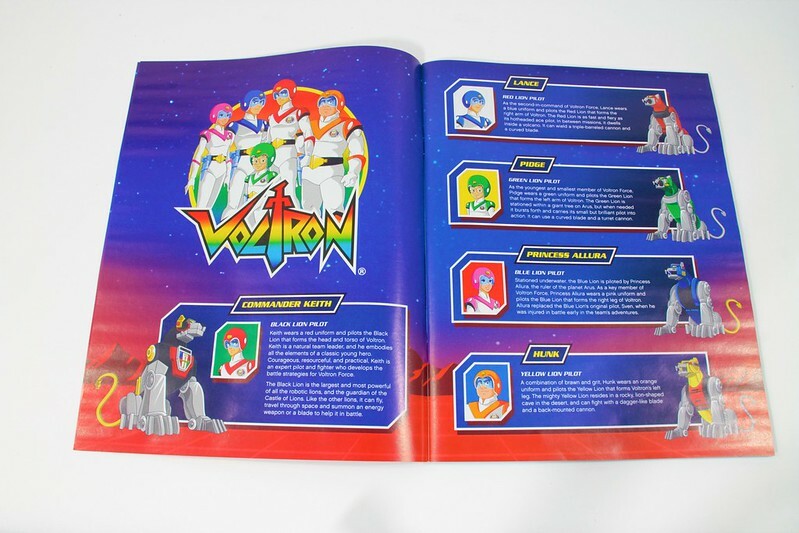 A bit strange that they mention 5 of the 6 pilots, when a lot of merchandise I've seen shows Sven despite him not being in it for long. Nice work on the review @Ecclesiastes! Having seen this model in Billund earlier this year, I was thoroughly impressed. By its size, but also by how it's built. Not a life long fan, but like you I like the old stuff from back in the days. The box really has that eighties vibe going on. I will buy this set for sure! Thanks for this awesome, thorough, and very well-photographed review @Ecclesiastes! 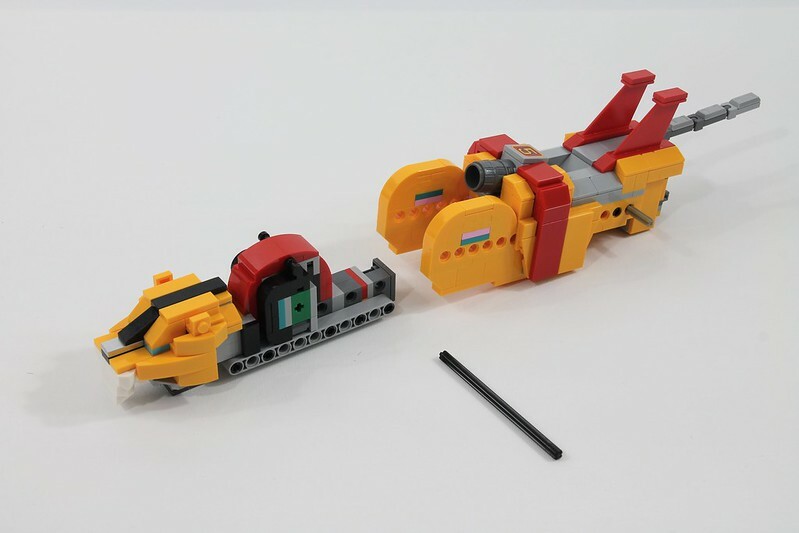 I have to say that your review really helped me appreciate all that LEGO has achieved with this model - great engineering using a wide variety of connection types to keep it strong, and just tons of interesting building. And yet in my mind they have achieved another feat, which is using so many amazing modern building techniques while still having the result of it looking like a very blocky, 90's kind of a model. Perhaps the aesthetic of the source material just wouldn't appeal to me (I wouldn't know as I've never watched it), but from the very first pictures all the way through seeing the set in your review I can't help but find it unappealing, ugly, choppy, and something I'd never want. 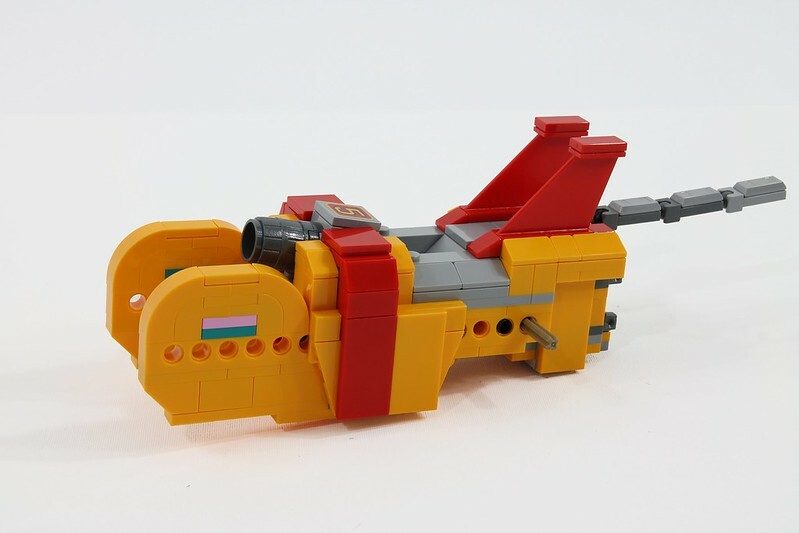 There are lots of LEGO sets out there, the big ones especially, that I would never and will never get because my budget doesn't allow it. Still, in the case of lots or most of the big sets (the Helicarrier, Ninjago City, the Millenium Falcon, etc. etc.) I look at them and go "wow, I'll never get that, but nicely done". 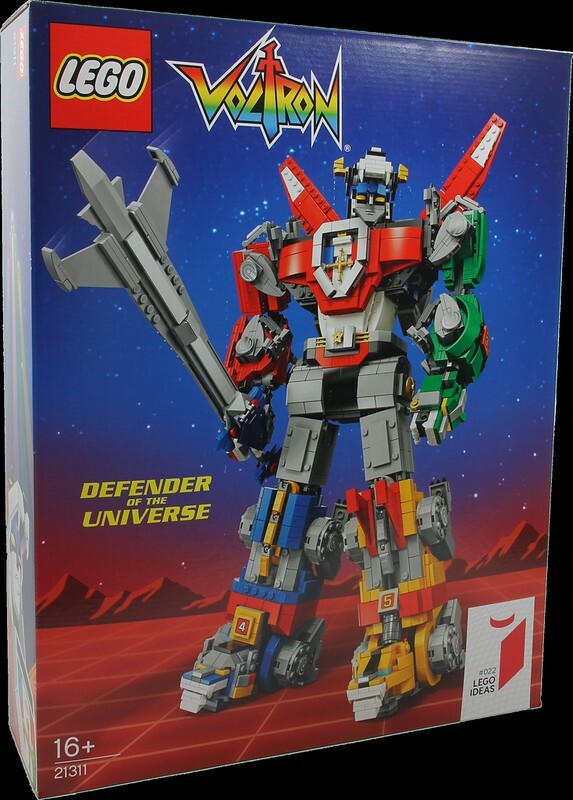 Somehow this Voltron set just really doesn't appeal to me at all and I think that's partly because, like I said, it looks so angular and blocky even though so many modern techniques and parts are used. It's puzzling to me. Ecclesiastes, thanks for sharing this lovely review. Glad to see this ready to fight the evil lurking in the universe. I had watched the cartoon back in the 1980s and enjoyed my childhood very much. 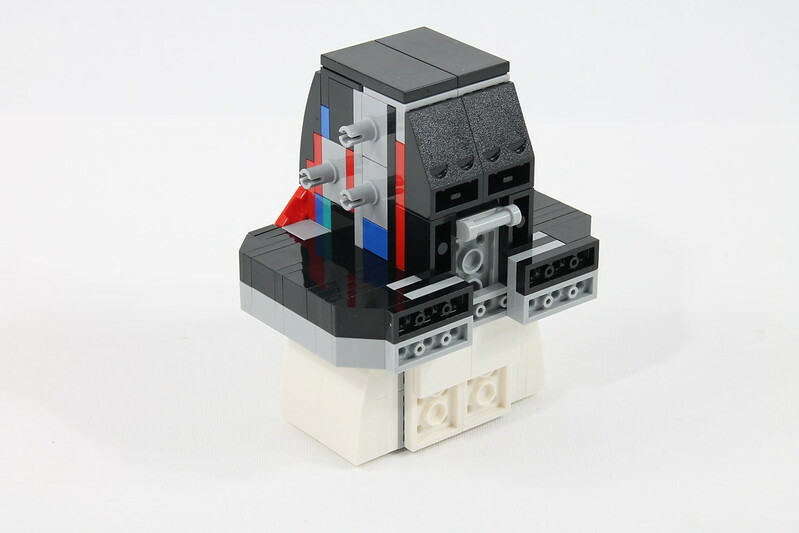 Seeing this actual Voltron being built into a Defender kind of put me in a mixed warm feeling. 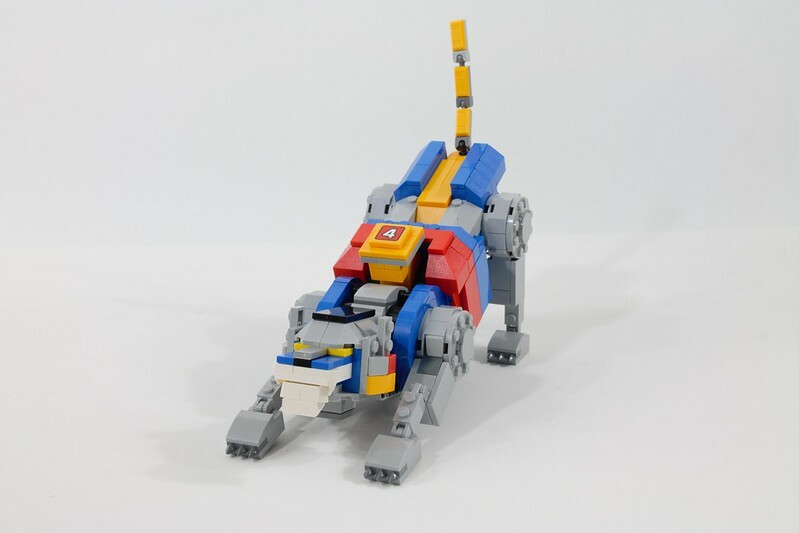 It's great to see an iconic childhood toy re-appearing and at the same time, feeling impressed with the integration of the 'tigers' forming Voltron. It increased the playability and stay true to the original. 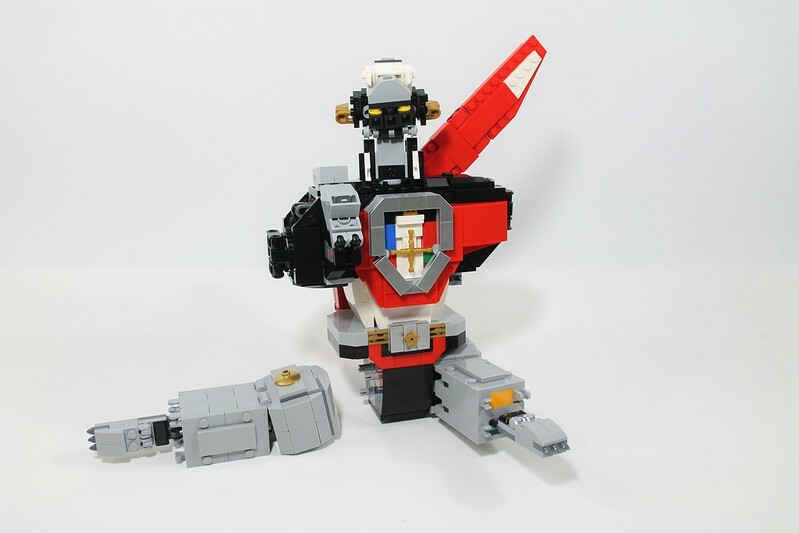 This set is definitely in the eyes of Voltron fans and if you guys are wondering what is this cartoon all about? Check out Netflix for viewing. 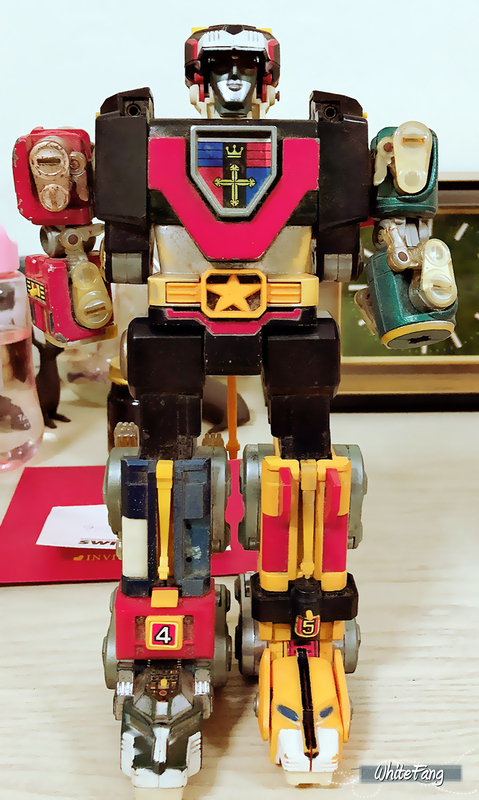 Meanwhile, I have my very own childhood Voltron toy to share. Great amazing review @Ecclesiastes! This is such an amazing set! 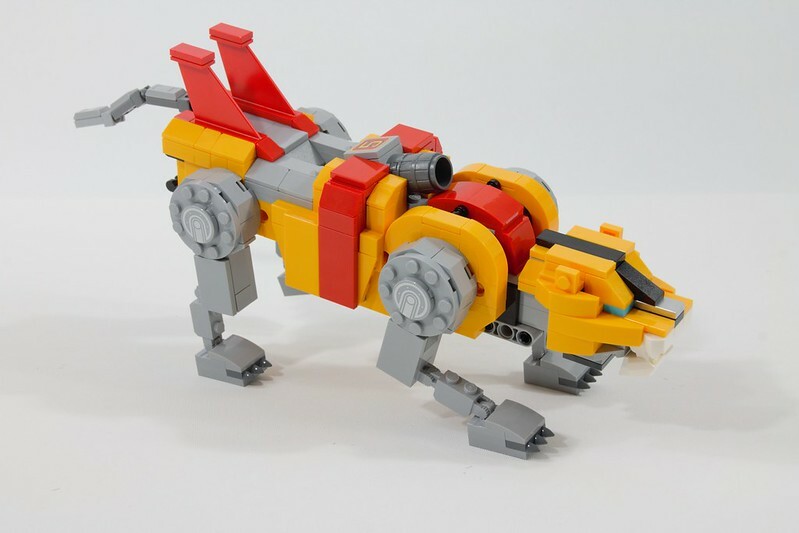 I love these lovely lions and the build reminded me about Fenris the wolf in Hela's set. 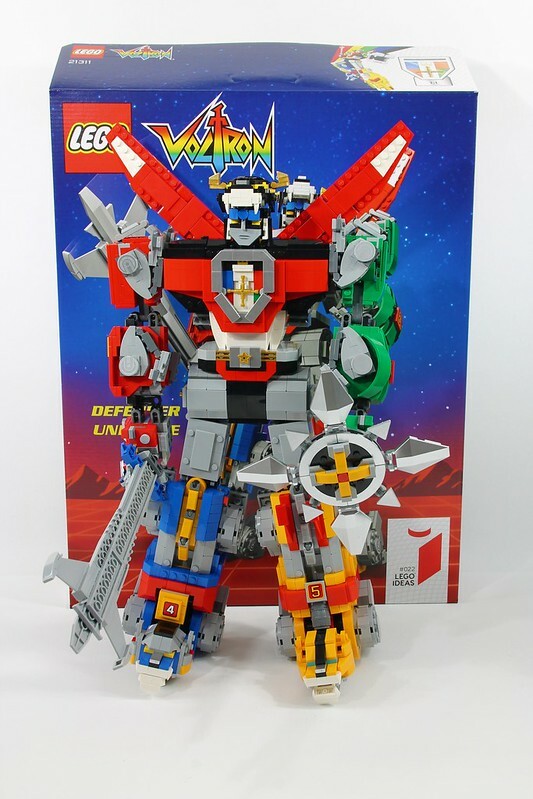 As I mentioned in the discussion about the set itself, I only discovered Voltron a few years ago, but both the original and the reboot grew very quickly on me. 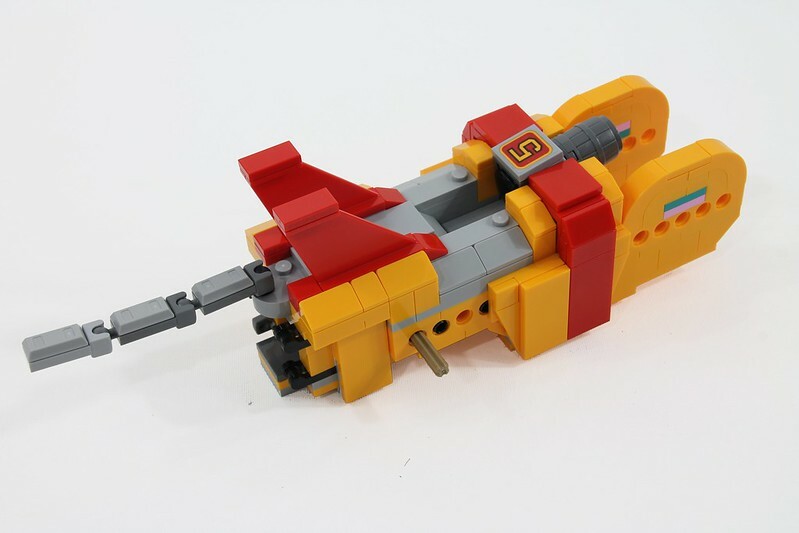 This set is a bit too expensive for my liking, but it looks very impressive. Thanks for an awesome review for such an awesome set. 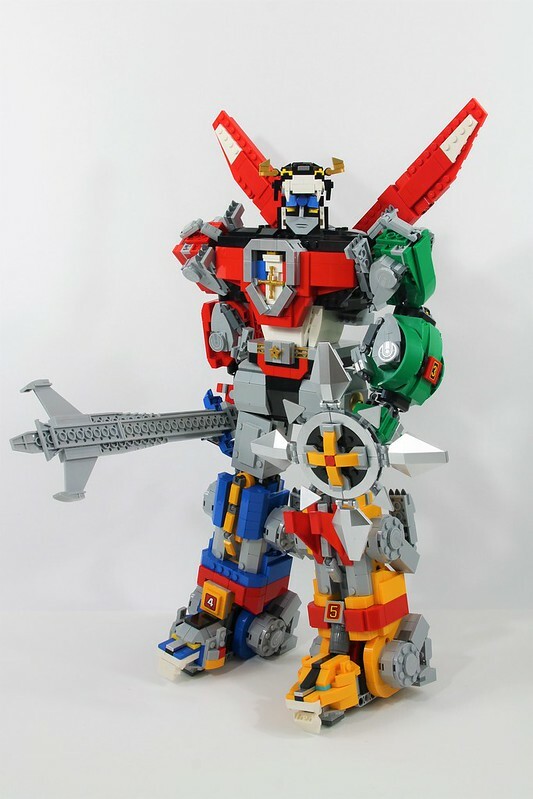 I'm a HUGE Voltron fan from the 80's and also of the new Netflix series too. 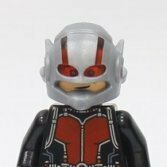 I also would of liked at least a set of minifigs even if just for display purposes only. 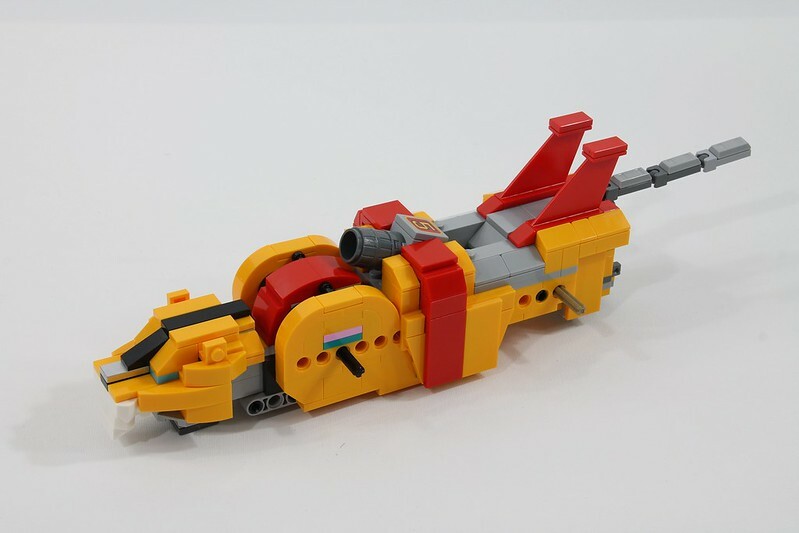 The design is perfect as can be in Lego. That said, the Black Lion is a serious disappointment of compromise and kibble. 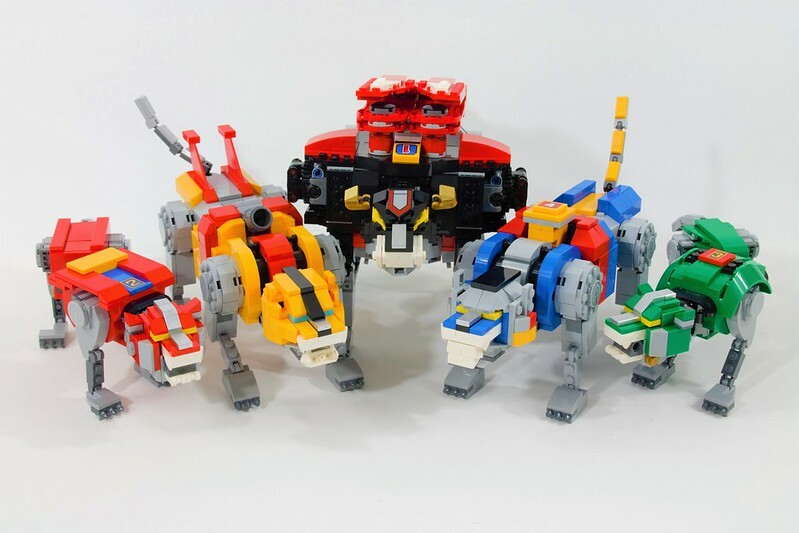 In many ways I prefer the Voltron set in Lion mode but the Black Lion is just so offensively ugly (especially compared to his more colourful counterparts) that I just can't bring myself to display them that way. 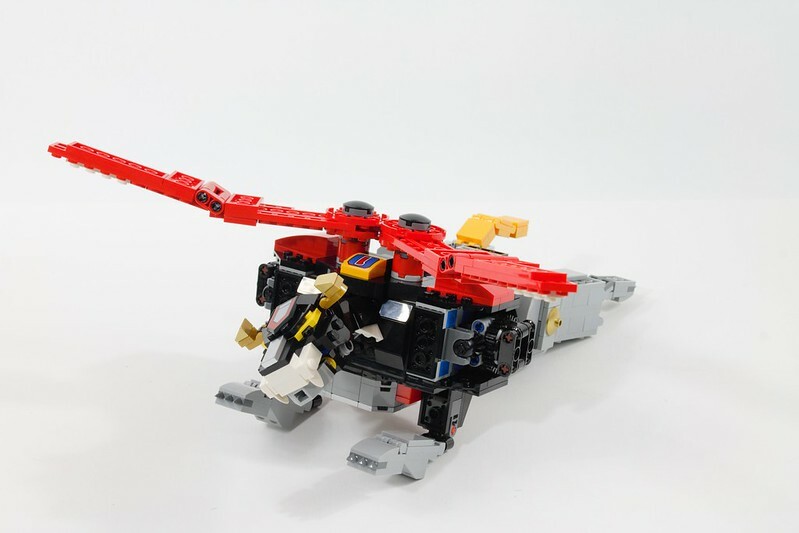 That said, I'm always secretly pleased when a set has flaws, be they minor or major; it's going to be a real challenge to re-engineer Black Lion as something that looks great in lion form while still scaling with the rest of the set and remaining robust in its duty as torso, head and thighs. 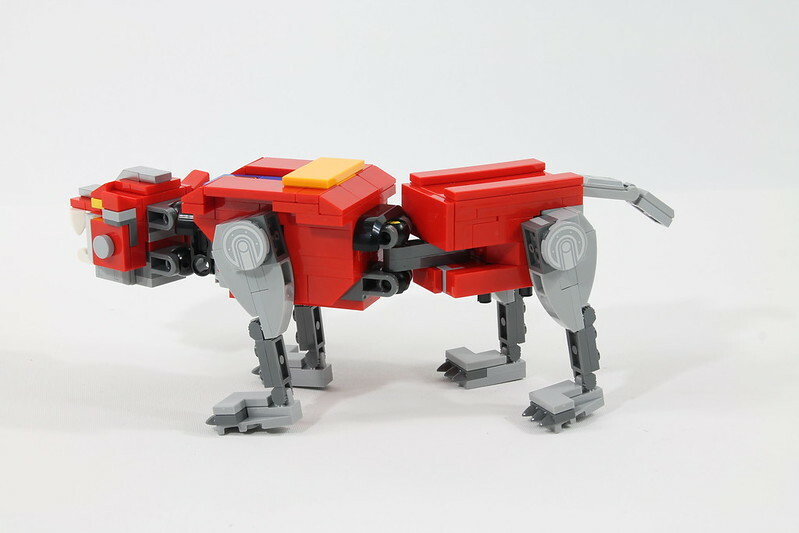 I'm actually really hoping that others share my disappointment with Black Lion, not to be negative; but rather in the hopes that I will see lots of other creative modifications - which is surely in the true spirit of LEGO anyway. I concur with 8/10, but I must emphasize that it's a positively glowing 8/10, flaws be damned! 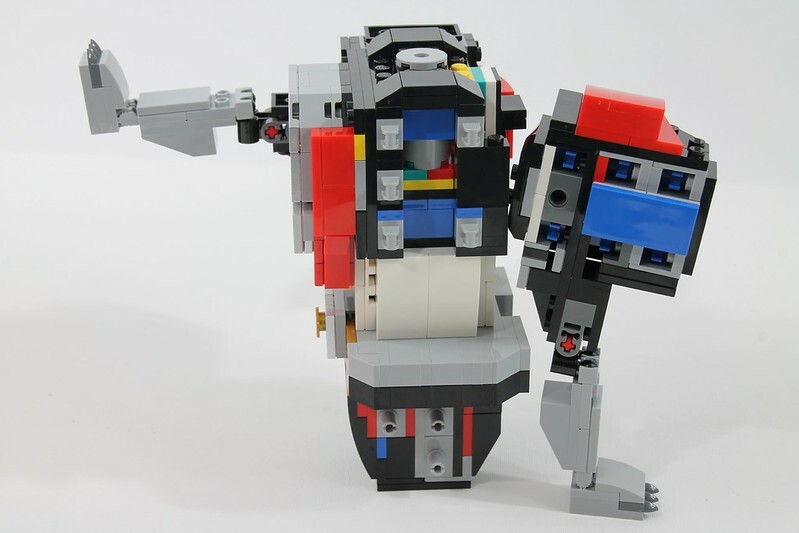 I'm so happy that LEGO Voltron happened, I genuinely never thought it would. Wow, that is very tall!! Great review!! ENTRY DEADLINE: Submit your entry no later than the 24th September, 2018 at 6:00 a.m. EST. Finally got my hands on this beast. This one really feels like you get your money’s worth, it’s massive! It was so fun building this set, being such a huge fan of the show growing up. Seeing the lions take shape was great. I feel personally proud as I didn’t rush this. I built it over three days-legs, body, arms. I'm a super robot fan. 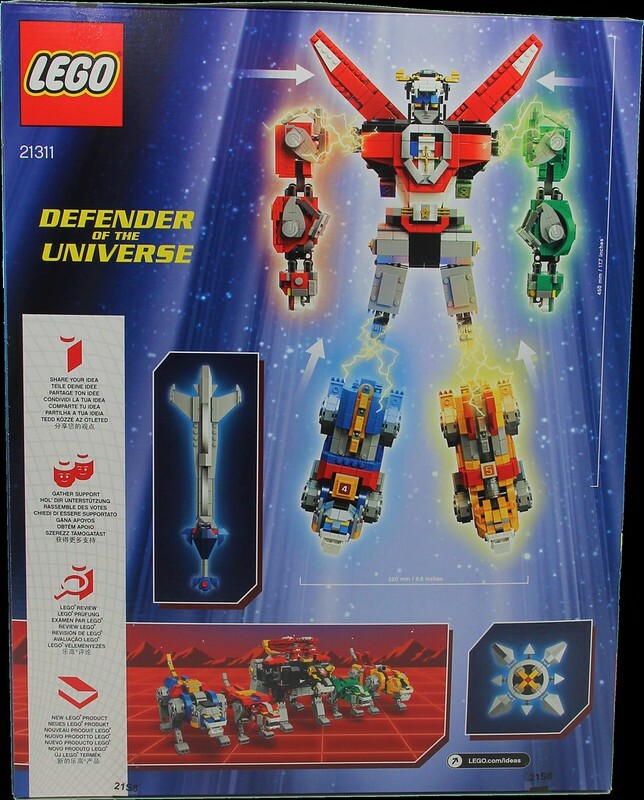 When Lego Voltron was announced, I was in a semi-dark age Lego-wise, Voltron got me to join the Lego VIP program so I could preorder. I also took my time building this and thoroughly enjoyed it. Few months later, I feel like I'm completely out of the dark age and find myself building a MOC Helm's Deep (been looking at Eurolock's HD a lot).